Posted in Misc and tagged Dublin, Flipping, Property at 10:22 am on October 30, 2014 by Aaron McAllorum. I wish the Irish Times would flip off. Someone buys a wreck, invests heaps of cash and sells it to a willing buyer. What is your problem with that? My local cafe buys in butter, sugar, flour and eggs and sells cakes at a big margin. Should they flip off too? I know one guy who is the son of a developer. He was given a stash of money on the sly before his Dad went bust. He then bought a load of properties during the recession which he then did up and now rents out. He’s also benefitting from the Fine Gael introduced Capital Gains Tax exemption for people who purchase buy to lets and keep them for seven years. It’s a way for wealthier cash rush to make money out of the recession and avoid paying tax to the state. When that exemption is up, this guy will sell off some of the properties he bought with Daddy’s money. That’s what goes on folks. The rich help each other get richer while avoiding their tax duty to their fellow citizens. Thanks for that example of capitalism Mr T.
It’s actually an example of tax fraud and state subsidy at the expense of the majority of citizens. The money was not declared for tax, so that’s fraud. It was also moved to hide it from a bank which was owed money. And then the Fine Gael government introduced a tax exemption for seven years for property investors. So that’s another big loss of revenue for the state, benefitting a person who has already defrauded the state. Capitalism would have seen the banks fail rather than have their debts forced upon the state and therefore the citizens. If this happened in the US, this guy would be in jail and so would his father. He is already being pursued by the authorities. So I don’t need to report him. You can practically smell the success-hating begrudgery from this post and the comments underneath. Pathetic really. Nothing at all wrong with honest success which I assume this is. But any gain which is at the expense others through illegality or tax fraud is to be condemned fully. Where is the illegality or tax fraud in this instance? Your anecdote about someone that you heard down the pub doesn’t mean that everyone who is involved in property development in any capacity is a criminal. Well if you bothered to read my comment properly, you would notice that I did NOT suggest this example of flipping was fraudulent at all. So careful with your assertions. And the example I gave was of someone I know personally, not a story from the pub. Who you also said was being investigated by Revenue. What more do you want? Totally agree. There’s nothing to see here… Man buys house, puts years or work and money into it and sells it for a profit. Move along. If this lad can’t explain where the cash came from Anti Laundering protocols woulda stepped in. Your aquaintance, at the very least, paid Gift Tax and Stamp Duty. His Daddy’s creditors could easily got the transfer overturned if its as sloppy as you made out. All wealthy people have ways of avoiding inheritance tax. They have the money to pay financial advisors to do it for them. And it’s quite easy to have a ‘foreign’ company buying up property and renting it out here. All you need is a director overseas which is usually a solicitor. I don’t see the problem either. There are plenty of TV programmes and books about how to identify poorly-maintained houses which are for sale at a good price, how to invest in repairing it and then knowing how to sell it for a profit. That’s what this person has done. If you think that the purchase, repair and sale is dodgy, give Revenue a call. It never went away, they were just in a buying phase. I like to see old places like this restored to their former glory. Derelict buildings are practically a sin in my book. I’d be interested to know how much they put into it though. Also personally I’d find this rather fun. Redoing a house can be a hobby, very therapeutic. Helped my parents do it once to an ancient cottage and it was very satisfying, if dirty, work. Its a great deal as long as they didn’t put 2.5 million into it. I assume everybody is happy. The person who did up the house and the person is doesn’t mind dropping 3.3 million on a smashing looking new gaff.. This had an asking price of €1.5m or €2m when it was for sale in 2012; which was way over what it was worth, it was worth €900k – €995k in my opinion then; I’d say €500k was put into it. 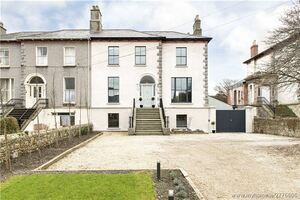 At the top end of the market prices have doubled since so it is probably worth close to €3m. Exactly – it’s worth something to someone. Houses have a price, not a value. If a house is worth more to me than you, that doesn’t change the value , but it can change the price. ‘in my opinion’ As a property valuer? ‘I’d say €500k’ As a surveyor? Is broadsheet.ie joining the property cheerleading ranks? Disappointing if true. Did you learn to English comprehension in the Irish education system? Disappointing if true. OK. I actually viewed that house, can’t remember when exactly but twas about a year ago. If not more. Too much house for me. And I don’t want a gaff that I can’t heat without worrying. Still. Quite stunned at that price tbh. The LPT and Utility Running Costs would suggest different. And I won’t be surprised if this turns out to be phooney. Cause if I had buying power of 3.5mill and after tax annual income than can manage that gaff….